Tissue biopsy is the predominant diagnostic procedure that is used for cancer diagnosis and treatment monitoring. Tissue biopsy is essentially dependent on invasive surgical procedures which in many instances preclude the regular treatment monitoring and sometimes the initial diagnosis too. This has elevated the requirement for novel diagnostic approaches. The search for better minimal invasive diagnostic procedures aimed at aiding regular monitoring of a patient’s response toward the treatment resulted in the evolution of liquid biopsy tests. Recent research on cancer biomarkers’ presence in biological fluids, such as blood which can be collected through minimal invasive techniques, has yielded promising results to develop better minimal invasive diagnostics procedures known as liquid biopsy. Liquid biopsy is a minimal invasive medical procedure with the ability to detect the presence of molecular cancer biomarkers in the biological fluids. The derived test results aid the doctors in deciding the further steps in the treatment of the patients suffering from cancer. The test principally involves the usage of samples of biological fluids, such as blood, urine, serum, and saliva, among others, and then the enrichment of the samples using different techniques, such as Next Generation Sequencing (NGS) and Polymerase Chain Reaction (PCR), to detect the mutations known to cause cancer. The purpose of this study is to gain a holistic view of the liquid biopsy market in terms of various influencing factors, such as recent trends, regulatory frameworks, and technological advancements in the market. The scope of this report constitutes a detailed study of the different kinds of products associated with the global liquid biopsy market. The market has been segmented into “Biomarker”, “Clinical Applications”, “Therapeutic Applications”, “Products and Services”, and “Region”. The report presents the reader with an opportunity to unlock comprehensive insights with respect to the market and helps in forming well-informed strategic decisions. The research uncovers some of the substantial parameters that must be taken into consideration before entering into the market. 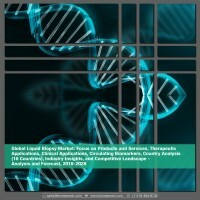 This research report aims at answering various aspects of the global liquid biopsy market, with the help of the key factors driving the market, restraints and challenges that can possibly inhibit the overall market growth, and the current growth opportunities that are going to shape the future trajectory of the market expansion. The report includes an in-depth examination of the key players and recent developments taking place in this market. Moreover, the report also includes chapters on market dynamics (market drivers, opportunities, and challenges) and industry analysis as well. The research study highlights the factors governing the industry attractiveness with Porter’s Five Forces for a comprehensive understanding of the global liquid biopsy market. Moreover, the study includes detailed product mapping, market estimation and analysis of key trends in multiple geographical regions, growth of liquid biopsy market in each region for different cancer types, and the key strategies and developments by the prominent liquid biopsy market stake holders. • What are the key features of the liquid biopsy technology promoting its incorporation in different clinical applications? • What are the key advantages of the liquid biopsy technology over tissue biopsy? • How did the liquid biopsy market evolve and what is its scope in the future? • What are the major market drivers, challenges, and opportunities in the global liquid biopsy market? • What are the leading companies dominating the global liquid biopsy market? • Which therapeutic application market would witness massive incorporation of the liquid biopsy technology in the forecast period? • Products based on which circulating biomarker are anticipated to witness massive rise in their demand in the forecast period? • How would the scope of clinical application of the liquid biopsy technology evolve in the forecast period? • What are investors’ perceptions about the global liquid biopsy market? • Who are the leading stakeholders of the market holding significant share in the market’s intellectual property? • What are the regulations pertaining to the global liquid biopsy market? • What are initiatives implemented by different government bodies to combat the growing prevalence of different types of cancer? • What was the market value of the leading segments and sub-segments of the global liquid biopsy market? • How will each segment of the global liquid biopsy market grow during the forecast period, and what will be the revenue generated by each of the segments by the end of 2028? • Which geographical location will contribute to the highest sales of the global liquid biopsy market during the forecast period? The key players who have been contributing significantly to the liquid biopsy market are Biocept Inc., Bio-Rad Laboratories Inc., Guardant Health, Inc., Myriad Genetics, QIAGEN, RainDance Technologies, Roche AG, Trovagene Inc., Adaptive Biotechnologies, Natera, Inc., Cynvenio Biosystems, Inc., Epic Sciences, ANGLE plc, Illumina, Inc., Menarini Silicon Biosystems., MDxHealth, Sysmex Inostics GmbH, Genomic Health, and NeoGenomics Laboratories, Inc., among others. 10.14 Menarini Silicon Biosystems, Inc.
10.18 Personal Genome Diagnostics, Inc. There has been a continuous search in the medical world for better minimally invasive diagnostic procedures to aid the regular monitoring of a patient’s response toward the treatment that he/she has been prescribed. This paved the way for the most awaited change in diagnostic procedures. In the recent years, the impressive research on cancer biomarkers’ presence in biological fluids, such as blood which can be collected through minimally invasive techniques, has opened new hopes to develop promising minimally invasive diagnostic procedures. Technological developments in the field of molecular diagnostics, sequencing technologies, and genomics have resulted in the evolution of liquid biopsy. Cancer, a global pandemic, is one of the leading causes of deaths worldwide. According to the research study conducted by the International Agency for Cancer Research, approximately 14.1 million new cancer cases were detected, and 8.2 million cancer deaths were reported in 2012. Moreover, considering the present prevalence rates, the number of cases detected are expected to grow over 21.7 million while the death counts are expected to reach 13 million. The rise in the count of cancer cases has been significantly increasing the global economic burden and was estimated at $1.16 trillion in 2010. The development of the liquid biopsy technology is aimed at enabling early diagnosis and treatment monitoring, thus consequentially aiding in combating cancer. Liquid biopsy is a non-invasive medical procedure which can detect the presence of molecular cancer biomarkers in biological fluids. The derived test results help the doctors in deciding the further steps in the treatment of the cancer patients. The global liquid biopsy market is anticipated to reach $2.94 billion by 2028, witnessing a CAGR of 14.45% in the forecast period 2018-2028. The global liquid biopsy market has been witnessing a stable promising annual growth rate of 11.77% from the past three years (2014-2017). Some of the factors such as growing prominence for non-invasive diagnostic procedures, massive requirement of novel diagnostic techniques enabling treatment monitoring, and substantial investments made in the field of precision medicine and companion diagnostics are acting as significant factors propelling the growth of the global liquid biopsy market. Currently, the liquid biopsy tests and services segment is the leading contributor to the global liquid biopsy market revenue. In 2017, the total market contribution of liquid biopsy tests and services was valued $344.8 million. The growing establishment of molecular diagnostics companies providing liquid biopsy tests with short turnaround times is bolstering the growth of the global liquid biopsy tests and services market. The global liquid biopsy market is currently dominated by products based on circulating tumor DNA (cTDNA). The contribution of the products based on circulating tumor DNA (cTDNA) was valued 45.00% of the total global liquid biopsy market revenue. In terms of clinical application, the global liquid biopsy market is dominated by treatment monitoring. In 2017, the market for liquid biopsy products enabling treatment monitoring was valued $313.7 million. However, the growing prominence of companion diagnostics is anticipated to bolster the growth of the market for products enabling treatment selection. Currently, liquid biopsy is majorly incorporated for the treatment of lung cancer. The contribution of lung cancer liquid biopsy products was valued $186.9 million in 2017. In terms of regional potential, North America is the leading contributor to the global liquid biopsy market and is contributed approximately 55% of the global market values in 2017. Currently, a significant work is carried out to develop medical procedure based on liquid biopsy for the diagnosis of several diseases other than cancer. Through the detection of different biomarkers, the diagnosis of cardiovascular diseases, infections, and immunological and genetic disorders is certainly possible and opens new hopes for the patients. The development of test kits to diagnose aforementioned diseases appears to be a great opportunity to serve the market for both the new and the existing players.